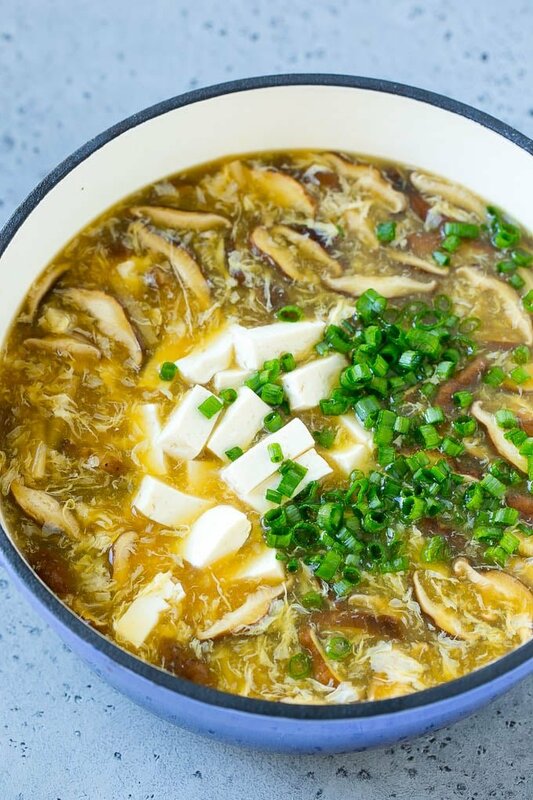 This Asian hot and sour soup is fresh mushrooms, tofu, egg, bamboo shoots and green onions, all in a savory broth. A remake of the restaurant favorite that’s so easy to make at home. I love to make my own Chinese take out at home – some of my all time best copy cat recipes include beef and broccoli and egg rolls. 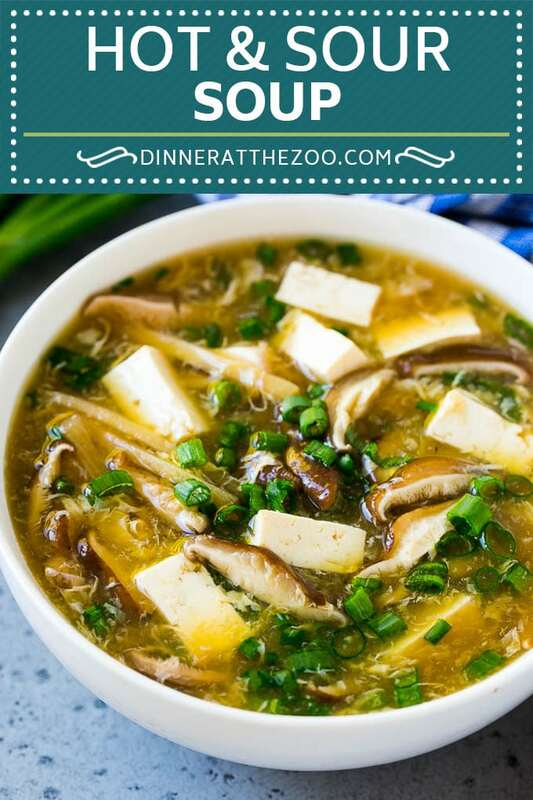 Hot and sour soup has been my favorite soup for many years, and it’s simple to whip up at a moment’s notice with ingredients you can easily find at your grocery store. Whenever I eat at a Chinese restaurant, I have to order the hot and sour soup. It’s my all time favorite soup, I prefer it over chicken noodle or any of the other classics. 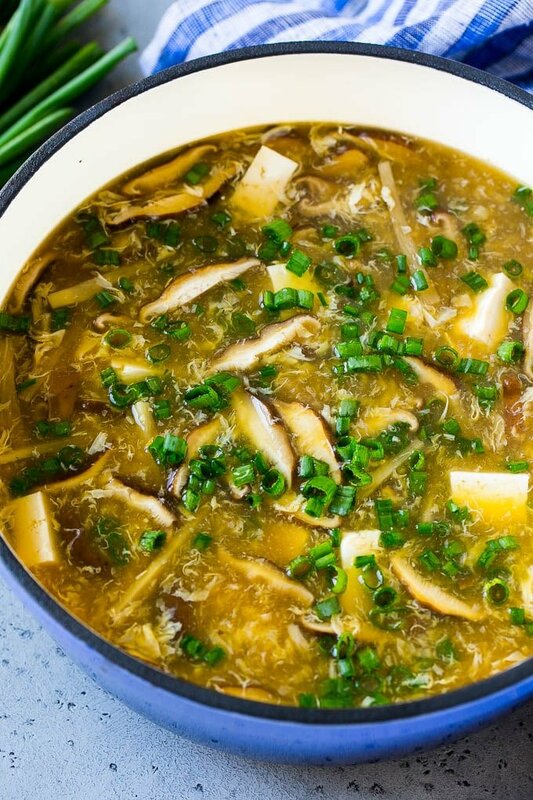 Hot and sour soup tastes exotic, and it happens to be quite easy to make. How do you make hot and sour soup? This soup starts with chicken broth, or you can use vegetable broth if you’re looking to make a vegetarian soup. 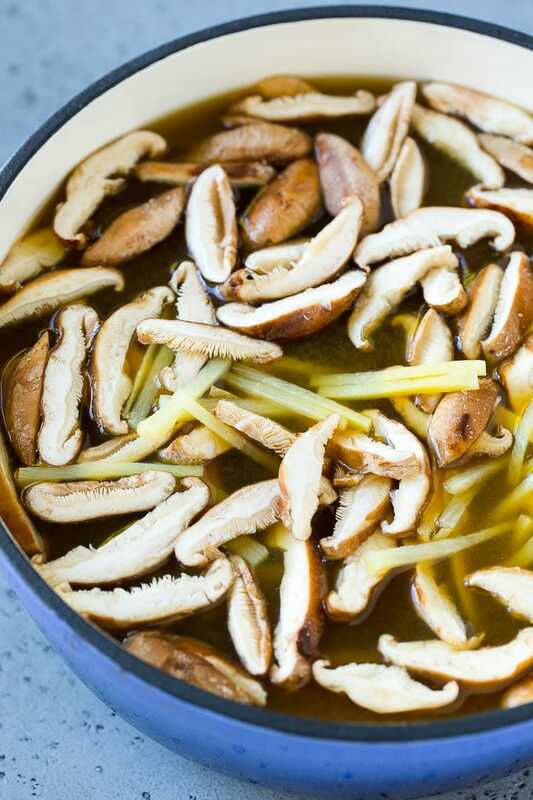 Sliced mushrooms, ginger and bamboo shoots go into the broth. The soup is thickened with corn starch, as well as eggs which are slowly poured in to create those pretty egg ribbons. The finishing touch is some tofu and green onions, then you’re ready to eat. I use fresh shiitake mushrooms for the most authentic flavor. If you can’t find this variety, white button mushrooms will also work fine. Bamboo shoots come in a can in the ethnic foods aisle of most grocery stores. Simply drain the can, slice the bamboo shoots, then add them to the soup. Be sure to use extra firm tofu so that it doesn’t disintegrate into the soup. Corn starch acts as a thickening agent to give the soup more body. If you don’t have corn starch, you can omit it, although your soup will be thinner. To make the egg ribbons, slowly pour beaten eggs into the hot broth while gently stirring the broth in a circular motion. I find that this soup is best served as soon as it’s made. 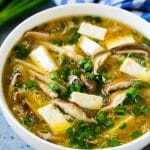 If you’re looking to prepare ahead of time, you can slice up your mushrooms, tofu and bamboo shoots up to 2 days before you plan to make the soup. I’ve ordered hot and sour soup at dozens of restaurants, and everyone has their own version with a little twist. This is a basic recipe, but you can alter it to your tastes by adding any of the following. Pork: Add thinly sliced pork tenderloin while the soup simmers. Spinach: Stir in fresh spinach leaves at the end of the cook time. Spice: Add a few teaspoons of chili sauce or sriracha. Shrimp: Add 1/2 pound raw shrimp while the soup simmers. Hot and sour soup can be served as an appetizer, or as a light main course. I typically serve it as part of a meal alongside our other Chinese food favorites and some steamed or fried rice. However you serve it, you’re sure to get rave reviews! 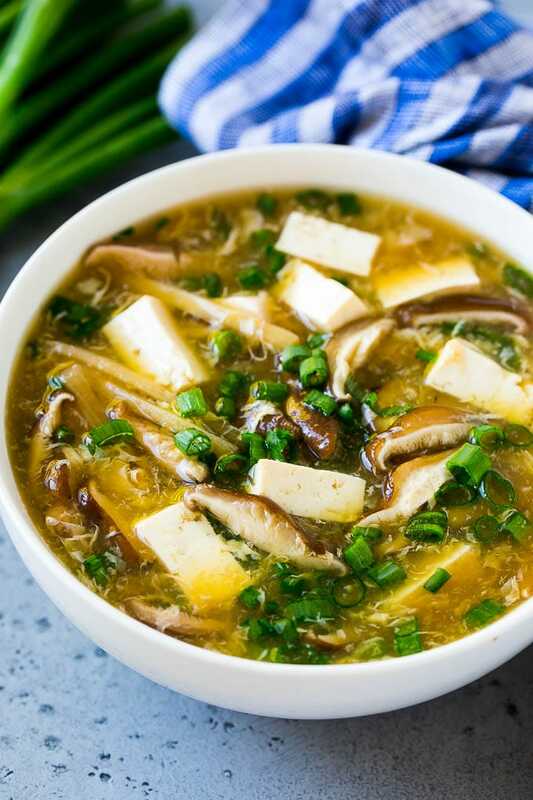 This Asian hot and sour soup is fresh mushrooms, tofu, egg, bamboo shoots and green onions, all in a savory broth. A remake of the restaurant favorite that's so easy to make at home. 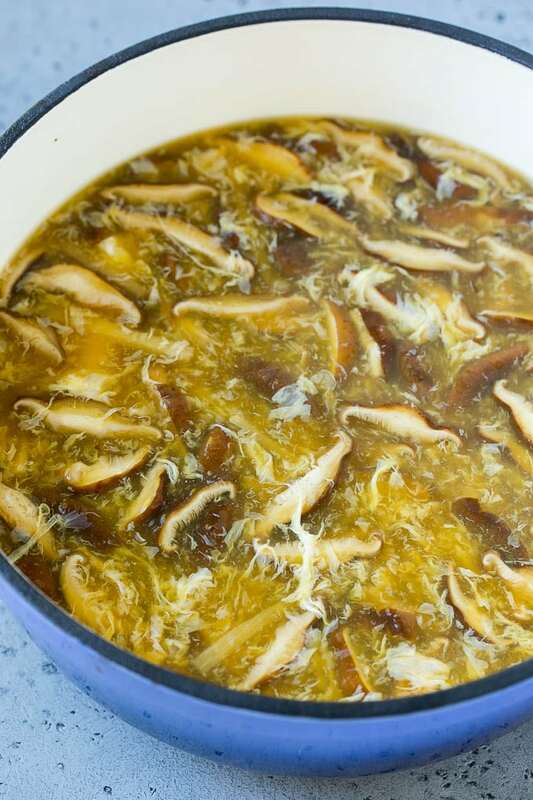 Place the chicken broth, ginger, soy sauce, rice vinegar, hot sauce, mushrooms and bamboo shoots in a large pot over medium high heat. Bring to a simmer. Cook for 5 minutes or until mushrooms are tender. Remove the piece of ginger and discard. In a small bowl, whisk together the corn starch with 1/4 cup cold water. Add the cornstarch mixture to the pot and stir well. Cook for 1-2 minutes or until soup has just thickened. Stir the soup in a circular motion while slowly pouring in the beaten eggs. Stir in the tofu, sesame oil, salt and pepper to taste and green onions. Cook for 2-3 minutes until tofu is heated through. Serve, garnished with more green onions if desired. O my yum! I just love hot and sour soup! Must give your recipe a try. Yum! This soup looks wonderful and so comforting. It’s a rainy, cold day here and I’d love a bowl of this right now. ow, I have never tried to make a hot adn sour and this recipe looks really delicious and easy. I will try to make this for my kids, thanks for sharing! I love hot and sour soup and it is perfect for this cold weather. Wow great soup. I will add more spice next time but was wonderful. I served it as a first course and then had your Honey Garlic shrimp stir fry. We will have the all the time. Easy and great flavors. My son has a cold and is home for the week from college. I made this soup for him and he swears it made him feel better! I’m so happy to hear that, hope he feels better soon! I’ve heard of sweet and sour but not hot and sour. I would love to try this hot and sour soup. My husband loves mushroom and he loves soup too. I guess he will love this one. Will try to cook this on weekend! Yum! Hot and Sour soup is my go-to soup when I eat Chinese food. Now I have a recipe– thank you so much! I will definitely give this a try! Wow! This Asian hot and sour soup looks so delicious. Will definitely try making this at home. That looks so amazing! I can’t wait to make it. I love Asian food. Love this site. Get excellent ideas making the chicken with sundried tomatoes and spinach tonight, shrimp and garlic yesterday. So happy to hear that you’re enjoying the recipes!